A double-blind peer review method is mandatory for processing of all scientific manuscripts submitted to the editorial stuff of the journal. This implies that neither the reviewer is aware of the authorship of the manuscript, nor the author maintains any contact with the reviewer. Members of the editorial board and leading global experts in corresponding areas of sciences, invited as independent readers, perform peer reviews. Editor-in-chief, deputy editor-in-chief or science editor choose readers for peer review. We aim to limit the review process to 2-4 weeks, though in some cases the schedule may be adjusted at the reviewer’s request. to reject the manuscript outright. If the reviewer has recommended any refinements, the editorial staff would suggest the author either to implement the corrections, or to dispute them reasonably. Authors are kindly required to limit their revision to 3 months and resubmit the adapted manuscript within this period for final evaluation. Original reviews of submitted manuscripts remain deposited permanently (not less than 5 years). Manuscript reviews are not published. Reviews can be sent to the Ministry of Education and Sciense of Russian Federation in case of query. The journal is published four times a year. Issues of the magazine are formed on the basis of materials of editorial portfolio, passed the necessary assessment procedures and discussions at meetings of the editorial board. As part of the magazine can be published articles underlying performances at conferences, organized by the Peoples' Friendship University (on the recommendation of the Conference Organizing Committee). Circulation 500 copies printed version. This journal provides immediate open access to its content on the principle that making research freely available to the public supports a greater global exchange of knowledge (open license Creative Commons Attribution International 4.0 CC-BY). This journal is an open access journal. All articles are made freely available to readers immediately upon publication. Our open access policy is in accordance with the Budapest Open Access Initiative (BOAI) definition - it means that articles have free availability on the public internet, permitting any users to read, download, copy, distribute, print, search, or link to the full texts of these articles, crawl them for indexing, pass them as data to software, or use them for any other lawful purpose, without financial, legal, or technical barriers other than those inseparable from gaining access to the internet itself. For more information please read BOAI statement. Editors have sole responsibility for acceptance or rejection of a manuscript. The manuscript may be rejected by the editor on the stage prior to peer-review for a solid reason (inappropriate topic for journal, clearly of poor scientific quality, the article was previously published elsewhere, essential contradiction to ethical principles of the Journal was detected). Editors should only accept a paper when reasonably certain. Editors should guarantee that the quality of the papers conforms to internationally accepted scientific and publication ethical guidelines. If there is conflict of interest of the editor with the author of the article, the article should be transmitted to another editor. The editor transmits all the submitted manuscripts, which were not rejected according to the reasons stated below, for peer-review. The editor chooses the reviewers out of the most competent specialists on the topic of the article. Editors should preserve anonymity of reviewers and should not tell the reviewers the names of the authors. Editors should guarantee the quality of the papers and the integrity of the academic record and be willing to publish corrections, clarifications, retractions and apologies when needed. Review and professional publication articles should also be accurate and objective, and editorial opinion works should be clearly identified as such. The editorial board adheres to ethical standards in its work and, above all, defending the right to editorial independence. Placement of promotional materials and sponsorship can not influence in any way on editorial decisions and editorial content. The journal does not publish materials to accompany the advertising and does not sell advertising for specific articles. Advertising and information materials is not mixed with the editorial content. All decisions on advertising placement are only accepted by the publisher. The editors reserve the right not to accept advertising materials, placement does not meet the publication policy. Plagiarism takes many forms, from passing off another paper as the author(s) own paper, to copying or paraphrasing substantial parts of another(s) paper (without attribution), to claiming results from research conducted by others. Plagiarism in all its forms constitutes unethical publishing behavior and is unacceptable. use of the materials without written permission, the authors or copyright holders of which don’t permit use of their materials without special approvement. excessive citation (in case there are references to the sources and graphical highlighting of the cited text), the volume of which is not justified by the genre and aims of the article. Only original works are acceptable for publication in journal. The journal does not allow any forms of plagiarism. If the authors have used the work and/or words of others, that this has been appropriately cited or quoted. The journal is using "ANTIPLAGIAT" software for plagiarism detection in all Russian-language manuscripts. The Google Scholar is used for English-language manuscripts. Papers will be rejected from any stage of the publication process (even if the article was published already) if plagiarism will be fined. Papers will be rejected from any stage of the publication process (even if the article were published already) if plagiarism will be fined. In general, an author should not submit for consideration in another journal a previously published paper. Publication of some kinds of articles (eg, clinical guidelines, translations) in more than one journal is sometimes justifiable, provided certain conditions are met. The authors and editors of the journals concerned must agree to the secondary publication, which must reflect the same data and interpretation of the primary document. The primary reference must be cited in the secondary publication. When reporting experiments on human subjects, authors should indicate whether the procedures followed were in accordance with the ethical standards of the responsible committee on human experimentation (institutional and national) and with the Helsinki Declaration of 1975, as revised in 2000 and 2008. If doubt exists whether the research was conducted in accordance with the Helsinki Declaration, the authors must explain the rationale for their approach, and demonstrate that the institutional review body explicitly approved the doubtful aspects of the study. When an author discovers a significant error or inaccuracy in his/her own published work, it is the authors obligation to promptly notify the journal editor or publisher and cooperate with the editor to retract or correct the paper. If the editor or the publisher learn from a third party that a published work contains a significant error, it is the obligation of the author to promptly retract or correct the paper or provide evidence to the editor of the correctness of the original paper. In some cases the Editorial Board may consider retracting a publication. the findings have previously been published elsewhere before the date of its publication in the journal. The published article has serious errors, which place its scientific value in question. In such cases the Editor should initiate the revision, after which the article may be retracted. The Act on retraction is complied, which is signed by the editor-in-chief. The copy of the Act is being sent to the author of the article. In this case the article is not physically withdrawn from the published edition and the file of the issue on web site. 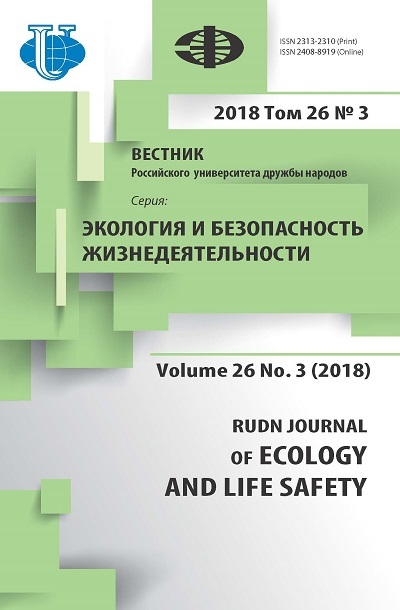 The Editorial Office publishes the notification on retraction of the article on the corresponding page of the issue content on the official site of the Journal. The Editorial Office should attentively consider issuing an expression of concern about the revealed problems in the published materials. The Editorial Board considers it a responsibility of authors and reviewers to promptly inform about the missed mistakes and breaches revealed after the publication of the article. Information about the authors (surname, name, family name, affiliation, e-mail, contact number), which is provided by them for publication in the journal, is becoming available for indefinite range of persons, for which the authors give their permission by providing his article in the online system on the website of the journal. The following data is published for the convenience of the authors with the aim of the full and correct account of publications and their citation by the corresponding bibliography companies and providing the possibility of contacting the authors ans the scientific society. Personal information provided by the authors in addition to the enumerated below include additional e-mails and phones. These will be used only for contacting the authors in the process of preparing the publication. The Editorial Board may not transmit this information to the third party, who can use in for some other purposes.